Home Bloggers' Conference Bride for Rent Bride for Rent BlogCon Kim Chiu KimXi love team Photos with the Stars Rocky and Kim Chiu Rocky and Xian Lim Rocky with Kim Chiu and Xian Lim Xian Lim Why Kim Chiu and Xian Lim's Tandem (KimXi) is the Hottest in Philippine Showbiz?! Why Kim Chiu and Xian Lim's Tandem (KimXi) is the Hottest in Philippine Showbiz?! The loveteam of Kim Chiu and Xian Lim popularly known as KimXi is undeniably the hottest loveteam today in Philippine showbiz! Their tandem in TV series or in movies were really top-rating and blockbusters! Even in the text votes or online poll surveys, KimXi is always the winner! Well, what do you think is the reason why their loveteam is very successful and emerge as the hottest?! During the Bloggers Conference of their upcoming romance-comedy film "Bride for Rent," I've asked Kim and Xian about the 'secret' of their loveteam success! According to them, the best key is their fans and supporters! Yes, because of the undying supports of their fans, KimXi emerged on top! They were one of the reasons why their loveteam is always trending in the social media, why they always won on different polls, why their different TV series were successful and top-rating, and why their films were blockbusters! Aside from their fans, for me, I think the other reason why the Kim-Xian tandem sells like a hot cake is their chemistry and Asian looks! 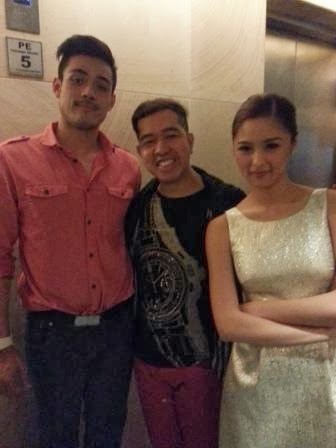 Since Kim and Xian are both Chinese or should I say both chinito and chinita, they look good and perfect together! Putting them together in one TV show or movie seems like watching your favorite Koreanovela or Asianovela! And yes, they were also a perfect recipe to a romance-comedy genre of movie or TV series! That's the reason why "My Binondo Girl," "Ina Kapatid Anak," and "Bakit Hindi Ka Crush ng Crush Mo?" were very much successful! Under the direction of Ms. Mae Czarina Cruz, "Bride for Rent" is set to hit the theaters this Wednesday, January 15, 2014. If i have a son i want my son had a wife like kim vise versa to xian if i have a daughter..